I asked to become involved with KRL's Facebook page because, having learned from my experience as the lead administrator of a page at my previous job, I knew it could be significantly improved. When I arrived, Facebook was being used for announcements only. Posts were one-way broadcasts, lengthy, and did not encourage interaction. With a small group of passionate colleagues, I worked to expand the ways we used social media. For example, I encouraged short, interactive posts that posed questions, included media, and introduced humor. Secondly, I made a concerted effort to respond directly to comments on the page. Also, I pushed for the passage of a social media policy that allowed us to interact with other pages, liking, tagging, and posting comments in appropriate places. I also hope that this policy will serve as a set of clear guidelines for all staff members, so that many more staff at all levels will become empowered to post, just as they are empowered to represent the library in face to face interactions. Since that time, the number of people who "like" our page has increased significantly. Popular posts like the one below may be "liked" more than 100 times, shared up to 40, and attract several comments, while prior to these changes most posts had no comments, likes, or shares at all. We are excited for the possibilities that this opens up to provide better service via social media! 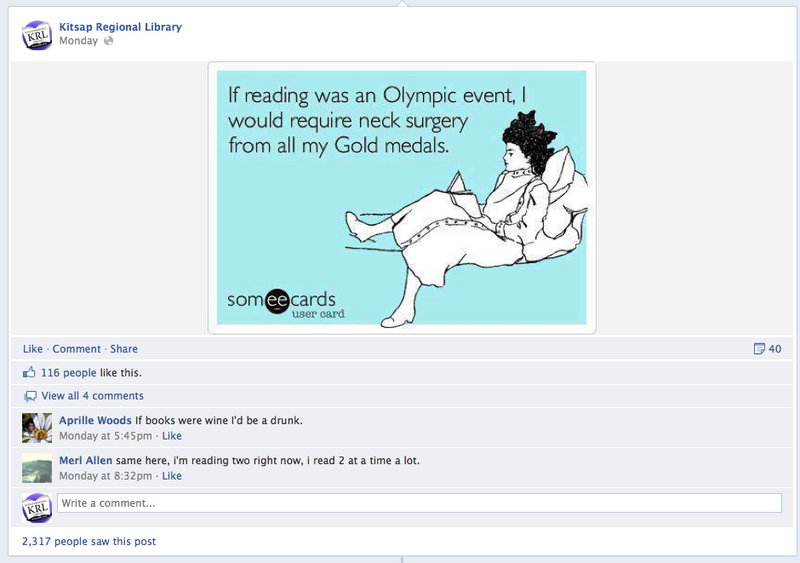 I head up a team of YA-focused librarians and staff who manage the newly-launched Teen Facebook Page, Teens of MPL. Currently this group creates and posts most of the content, but my goal is to increase teen participation and interaction. I introduced audio and video clips, and want to make content more two-way through techniques like a weekly poll question, rapid-fire readers’ advisory, and posting teen-generated book and media reviews. In addition to managing and improving content, I’ve also worked on developing and implementing our social media policy for this page. How can we meet the policies set by the state, city, library administration, and professional codes of ethics and behavior at all times, while still having enough flexibility to post and respond to content in a timely way? My future goal is to increase our fan base by fostering more interaction with other pages of interest to local teens. This can be difficult to do given the existing policies, and we still have plenty of work to do on engaging the teens who have already connected with us! So this one is on the back burner until the page has proven itself an important part of MPL’s 24/7 beyond-the-walls service.